European techniques, Pacific Rim cuisine, warm, from-the-heart hospitality. Together, they create the remarkable dining experience unique to Roy's Restaurant. The first Roy's was opened in Honolulu, Hawaii in 1988 by namesake Roy Yamaguchi, a James Beard Award winner. Since those early days, we've proudly spread our passion around the world — there are 16 Roy's restaurants in the continental United States, six in Hawaii, one in Japan and one in Guam. Welcome! 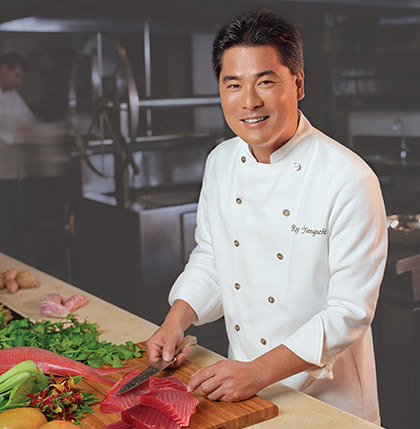 Culinary pioneer and Roy's founder Roy Yamaguchi was born in Tokyo. It was while visiting his grandparents on Maui that he had his first taste of seafood bought fresh at seaside piers — fond memories that would shape his future career. At 19, he graduated from the Culinary Institute of America in New York as a master chef and moved to Los Angeles where he served as executive chef at La Serene. After gaining invaluable experience in LA, Roy decided it was time to head closer to his roots. He moved to Hawaii and opened the first Roy's in 1988. "I've always been inspired by the bold and distinct flavors of the Pacific Rim and that's why I've dedicated my life to exploring and sharing their unique beauty. Roy's team of talented Chef Partners works to bring these flavors to life every day for our Guests, so everyone can share my inspiration." Send us your comments and questions anytime.